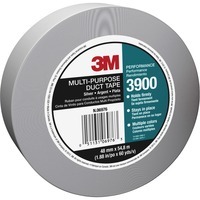 With one of the lowest profiles of 3M polyethylene duct tapes, this multipurpose duct tape is a great choice for low bulk applications. The natural rubber adhesive provides instant stick and long term holding power on a wide variety of surfaces, including irregular ones. Polyethylene coated, cloth reinforced backing conforms to curved and irregular surfaces and even resists moisture and humidity. Its high tensile strength makes it ideal for bundling materials. The tape tears easily, across or down, without curling.